until you fill in as many ancestors as possible. 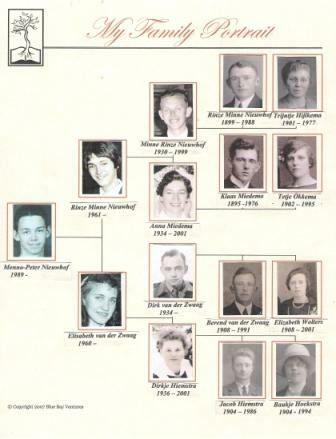 Pedigree Charts are also commonly referred to as a family tree, with the extended lines acting as the branches.It is the outline for your genealogy information. The pedigree chart only direct ancestors, there is no room for for siblings, other spouses, and other relatives. All that information can be gathered and recorded on the ' Family Group Sheets'. Instead of putting all the names and information on a pedigree chart, you place the persons portait in the places provided. When completed it will make a nice visual presentation. There will probably be blank spaces on the chart, and maybe after years of research they will not be filled.